People are urged to sign up for the Great British Beach Clean. A leading marine charity is looking for volunteers to get on board with the UK’s biggest beach clean event. There’s no doubt that being by the sea makes us feel better, and the Great British Beach Clean (September 15-18) isn’t just a good day out for people who love the coast – it’s great for wildlife and the beach too. The Great British Beach Clean is the only UK-wide beach clean event that not only spruces up hundreds of beaches around the coast but records litter finds too. In 2016, 268,384 individual pieces of litter were picked up by just under 6,000 volunteers who cleaned up over 360 beaches. Beach cleans take place from Cornwall to Cumbria, Denbighshire to Devon, Hampshire to the Highlands and all places in between. It incorporates the Great Channel Islands Beach Clean and the Great Northern Irish Beach clean. Beach litter has steadily risen over the 23 years since the Marine Conservation Society (MCS) began recording it. In 2016 tiny bits of plastic and polystyrene were the most frequently found litter items on UK beaches. 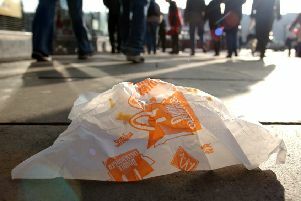 But although fewer plastic bags were found, there was a shocking 50 per cent rise in the amount of balloon related litter compared to the previous year and volunteer pickers found more drinks container caps and lids too – up four per cent on 2015. Lizzie Prior, MCS beach and river clean project officer, said: “Taking part in the Great British Beach Clean really can make a difference. To sign up to a clean near you visit: www.mcsuk.org/waitrose or call 01989 566017.